Today we’re very excited to introduce another another WP Courseware case study from an online entrepreneur who has created a business around an almost untapped niche. If you read our last case study covering Caitlin Pyle’s ProofreadAnywhere.com, you’ll know that we’re very fond of entrepreneurs who teach things no one else is teaching. As Joseph Michael states on his personal website, he was inspired to start his first online course “after realizing that money comes from solving people’s problems.” And even with a growing number of hugely popular and very comprehensive software tutorial sites such as lynda.com, Joseph couldn’t find what he needed. So What Was Joseph Searching For? As a budding online entrepreneur hoping to write ebooks to help build his business, Joseph was trying to become familiar with a terrific piece of software called Scrivener. The program is really the only tool you need to produce anything from a screenplay to an ebook. It allows you to brainstorm, collect and store research, write, edit, and format your project for delivery. It’s like having a word processor, web browser, Evernote, image editor, and a slide show software all rolled into one package. As I found when I first purchased Scrivener in early 2012, the full extent of its potential has the ability to increase your productivity immensely, but to utilize it fully you need to spend a good bit of time getting familiar with it. Joseph subsequently spent ten months producing content for a course which would become LearnScrivenerFast.com and in addition to a couple of other sites he launched, he built a $40,000.00 a month business in 24 months. Yep…that’s almost more than he was making annually as a full-time employee working while he built what he thought would be a little “side business”. He’s done a great job of laying out the Cliff Notes of his journey on this page if you want to find out more. And Why Are We Sharing Joseph’s Story With You? This story is not really about giving you a lesson on how to employ WP Courseware in any unique way, although we’ll give you some details on Joseph’s membership setup if you’re looking for a place to start. We’re very proud of the functionality and features WP Courseware offers, but Joseph utilizes the plugin pretty much right out of the box along with a couple of integrations. It’s really a story about recognizing a need for something and putting in the sweat equity developing awesome content. I’ve been through Joseph’s course and want to share some of what I feel he’s really done well so that it might help you as a WP Courseware user. As I mentioned before, Scrivener is very powerful. But there are a number of features that are far beyond the average user’s needs. 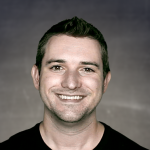 In January, Joseph was featured on Pat Flynn’s Smart Passive Income podcast. One of the topics he discussed with his Scrivener course was finding a way to create content which resided somewhere between accessing the power of the software and convincing people that it was easy to use. You don’t need to overburden visitors by teaching everything in your niche, but give them enough to be successful and not overwhelmed. The point above leads right into the first thing I noticed about Joseph’s course content. And it’s something which is discussed continually in e-learning circles. 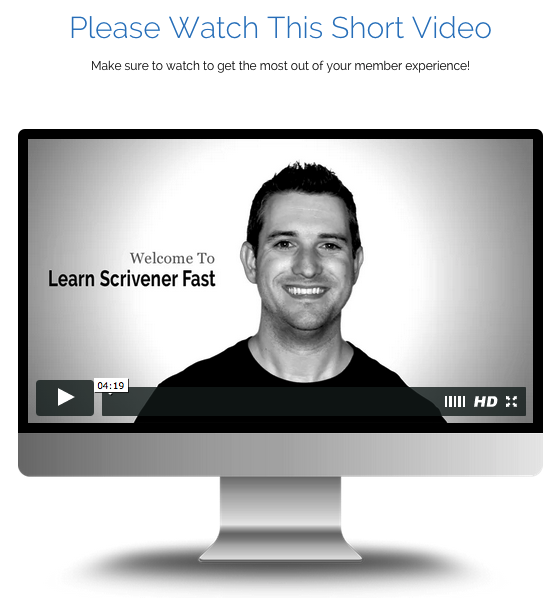 LearnScrivenerFast.com is a video-based training course. And the first thing I recognized was that Joseph’s content holds the student’s attention span because videos are kept short and concise, sometimes to less than two minutes. Why is this important? It not only reduces distraction and fatigue for a student in an e-learning course, but it also provides a handy way to bookmark content to return to important points for review. Joseph has a HUGE amount of incredibly valuable content and it would be overwhelming unless he planned out and structured his content the way he did. Another strategy which Joseph employed early on was giving his course away in order to gauge the demand and receptivity in his niche. He also used this process to obtain feedback on the content itself and still offers a small amount of free content today to draw visitors to his list and back to his site. When I found out that Joseph was a WP Courseware user, the first thing that screamed out to me was “What a genius idea…a Scrivener Coach”! Having struggled with the software myself, I couldn’t help but appreciate what a great idea it was for someone to build a paid training course around it. After all, when I started with the software there was nothing available to get up to speed. But it’s still what I would have considered a very “niche” software. Early on Joseph connected with some big names already coaching writers, people like Michael Hyatt and Jeff Goins, who helped him promote his course. And a little help propelled him quickly. How has Joseph Built His Course? Currently, Joseph is using WP Courseware to structure and deliver his course content. As you can see in the screenshot below, he has divided his content into several courses. The courses are listed on individual pages and are accessed through a really cool menu he’s created using images to link out to them. The course listing page is also headed up by a short welcome video from Joseph, discussing a bit about the course content and how to navigate the site. 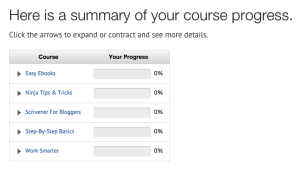 Once you’re inside a course, as we mentioned Joseph utilizes WP Courseware almost completely out of the box. As you can see below, he’s employing the overall course progress shortcode to list a student’s progress to all courses with no major modifications. The membership and e-commerce functionality is handled by WishList Member, a plugin many of you know that we’re very fond of. We currently offer a free integration plugin which will seamlessly link WP Courseware and WishList member, allowing you to automatically assign one or more courses to various membership levels so that you can easily sell your courses a la carte or in packages. Get my free video here! Again, we’re thrilled to share this case study with you and very grateful that WP Courseware has become the LMS plugin of choice for Joseph and LearnScrivenerFast.com. Since many of our audience members are bloggers, educators, or writers, we’d also encourage you to check out his site and find out if he might be able to help you improve your productivity with Scrivener. And if you’re interested in getting started with WP Courseware, we’d like to extend a special offer to you for taking the time to read this case study. 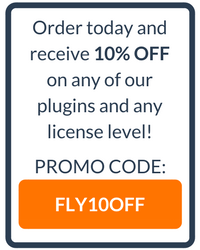 Simply go to the WP Courseware product page, select any license level, and enter promo code “LSF10” at checkout to receive 10% off your order. This is a great case study – I found the link on your twitter account and hopped over to read it. Oddly I had been following Scrivener Coach for months already! The tips you share on how Joseph he created the content – rather than focusing on your plugin added to the value. I am just now at a point that I have 5 live courses on my site – from 2 hour to 6 weeks duration. Integrating with Mailpoet via Woocommerce allows me to drip feed reminders and bonus content. Congratulations on your courses. We wish you the best! Thanks for this case study. I have struggled with CoursePress Pro. Unfortunately, I purchased it before I came across WP Courseware. Looking to get my first online course going by mid-January 2016! Hi Kimunya, we wish you the best with your new course in 2016! Thank-you for sharing this information it truly helps (inspires I should say!!). 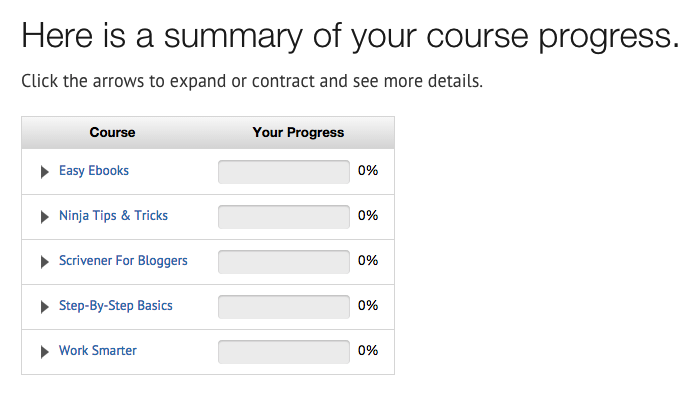 I have bought WP Courseware recently and I am glad I did. Nate, love your writing style, it is smooth flowing and easy. Please share more case studies. Thanks for the kind words, Deb! And welcome to the WP Courseware family! We have certainly enjoyed getting to know Joseph a bit and being a part of his entrepreneurial journey. We do plan to begin work on additional case studies. It’s always incredibly helpful for us to engage in conversations with our customers and learn about their use cases in detail.